Magnacharger 2010 Camaro SS L99 2300 System Black [01-23-60-173-BL] : Supercharger Superstore, Your Online Source for Vortech Superchargers, Paxton Superchargers, Procharger Superchargers, Magnacharger Superchargers and Techco Superchargers! Magna Charger’s new MP 2300 supercharger technology is the same used for the new ZR1 Corvette. The four-lobe rotor features a high-twist 160º helix that has improved efficiency (less power to drive), cooler discharge temperatures and is much quieter. Additional efficiency is the result of the unique bypass valve that reduces parasitic drag during normal driving. The Magna Charger also interfaces seamlessly with the GM Active Fuel Management system (some models) that cuts the engine to four cylinders at light throttle. 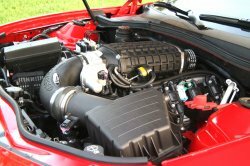 The Magna Charger ZRS Camaro system comes complete with a new, patented high-velocity aluminum intake manifold, integral water-to-air intercooler, and all necessary brackets, connectors, hardware and any needed specialized tools. The supercharger has a self-contained lubrication system that is maintenance-free. Calibration is included with a handheld computer programmer that re-programs the factory ECU and stores the original calibration for possible future use. A full instruction manual with color photos makes the step-by-step installation process easy to follow.